On February 19, 2015 Charles Wayne Kiway of North Richland Hills, Texas was sentenced to 15 years in state prison for securities fraud and theft. This was on top of a 10 year sentence for violating the conditions of probation from an earlier securities fraud incident. The two sentences will run concurrently. Kilway sold promissory notes and used the money to pay for personal expenses by transferring funds to his wife's account. In addition to the prison term he was also ordered to pay $602,120 in restitution. To read the actual order click here. Diane Glatfelter of Billerica Massachusetts Accused of Selling $2.2M In Fake "Bank Guarantees"
On February 15, Diane Glatfelter of Billerica, Massachusetts was barred from selling securities after selling $2.225 million in fictitious investments called "bank guarantees" through K2 Unlimited, Inc. and 211 Ventures, LLC. Glatfelter promised high returns and guarantees against losses. Additional penalties have yet to be announced. We'll continue to track this story as it evolves. On February 25, 2015 Joseph A. Noel, of Martinez, California was ordered to pay $315,000 resulting from a complaint originally filed by the Securities and Exchange Commission (SEC) on Nov. 17, 2014. As the CEO of the YesDTC Holdings, Noel is accused of defrauding investors via a pump and dump scheme. Noel issued misleading press releases and infomercials to market shares of his company, pushing the price of the thinly-traded securities up. He then sold his shares and made $300,000. Noel hid his sales through an account he made in his teenage daughter's name. To read the original charges click here. To read the final order click here. TheGAFI.com is a resource for investors to find out what actions government financial regulatory institutions are taking. Most important are the actions involving enforcement actions where funds have been paid. In 2013, the SEC collected over $1.6 billion in monetary penalties. In 2014, according to Chairman Mary Jo White's address at SEC Speaks 2015 a few days ago, the amount more than tripled to $4.1 billion. After the order is obtained, the money is placed in a “fair fund” for distribution to harmed investors. While every effort is made to identify harmed investors it is important to know how to follow up with the fund yourself. In the coming weeks we'll be publishing an updated contact list for our readers, meanwhile you can start by seeing if the company you invested in is on this list and following the instructions as posted for that particular claim. The Dodd-Frank Wall Street Reform and Consumer Protection Act is the catalyst behind much of the change going on in the financial industry today. It also authorizes the SEC to pay an award to eligible whistle-blowers if you submit leads to an SEC action that results in monetary sanctions over $1 million. To learn more about this program click here. You can see a list of FAQs about the whistle-blower program here. To see if a class action lawsuit has been filed relating to your investment you can visit Stanford's Securities Class Action Clearinghouse by clicking here. If the issue is with your registered broker/dealer going out of business you can visit the Securities Investor Protection Corporation to see if you can file a claim by clicking here. In addition to providing a Government Top Alerts Blog, TheGAFI.com also provides an SEC/CFTC Blotter Blog that highlights the latest charges announced, as well as an Events and Meeting Blog which provides a list of events and meetings held by financial regulatory agencies. You can jump straight to the blogs through the links above or go to TheGAFI.com to view a list of headlines. If you have any research requests or suggestions please reach out to us via the contact page. Pamela Gibbs, Director, Office of Minority and Women Inclusion, will be a panelist at Georgetown University’s Georgetown Law Women’s Forum. Location: Georgetown University, Eric E. Hotung Building, Room 2001, 600 New Jersey Ave., N.W., Washington, D.C.
Wednesday, Feb. 25, 2015, 8:30 a.m.
Andrew Ceresney, Director, Division of Enforcement, will give the keynote address at the SIFMA Anti-Money Laundering and Financial Crimes Conference. Feb. 24, 2015 —Today, the SEC charged Goodyear Tire & Rubber Company (NASDAQ: GT) with violating the Foreign Corrupt Practices Act (FCPA) by paying cash bribes to employees, government owned entities, local authorities and even the police in sub-Saharan Africa. Goodyear has agreed to pay ~$16 million to settle. The order from the SEC alleges that Goodyear failed to detect and prevent over $3.2 million in bribes due to inadequate controls in sub-Saharan Africa. Public companies must keep accurate accounting records, and Goodyear’s lax compliance controls enabled a routine of corrupt payments by African subsidiaries that were hidden in their books. This settlement ensures that Goodyear must forfeit all of the illicit profits from business obtained through bribes to foreign officials as well as employees at commercial companies in Angola and Kenya. In addition to the $16 million settlement, Goodyear must also report the steps the company is taking to prevent and identify bribery in the future. On March 12, 2015 @ 2:00 pm EDT, the Administrative Conference of the United States will have their first meeting located at 1120 20th Street, NW Suite 706 South. You can read more about what the Unified Agenda Project is here. To RSVP for the event go here. On March 31, 2015 @ 2:00 pm EDT, the Administrative Conference of the United States will have their second meeting located at 1120 20th Street, NW Suite 706 South. You can read more about what the Unified Agenda Project is here. February 19, 2015 -- Today the SEC charged Proteonomix, Inc., a New Jersey biotechnology company, and Michael M. Cohen, the CEO, with securities fraud. Both have agreed to settle with the SEC for a monetary amount tba by the court. The complaint covers 2008 through 2012 and alleges that Cohen pocketed more than $600,000 for his own personal benefit resulting from the issuance and transfer of millions of Proteonomix shares to entities named after Cohen's wife, children and father-in-law. In truth. Cohen directed all accounts and failed to disclose that the transactions were with related parties. To read the original release click here. I would like to remind investors to always do their own due diligence on any investment, and to consult their own financial adviser or representative when necessary. Any material provided is intended as general information only, and should not be considered or relied upon as a formal investment recommendation. Feb. 19, 2015 —The SEC charged VCAP Securities, an NYC based brokerage firm, and its CEO Brett Thomas Graham with fraud by deceiving investors in an auction to liquidate collateralized debt obligations (CDOs). The charge alleges that VCAP arranged for a broker-dealer to secretly bid at the auctions that it was prohibited from. VCAP was forbidden to bid on the CDO's it auctioned while serving as a CDO liquidation agent. VCAP had access to confidential bidding information that allowed them to win bids at prices only slightly higher than other bidders. The firm and CEO have agreed to pay approximately $1.5 million to settle charges. Graham abused a position of trust by playing the roles of both conductor and bidder during CDO liquidation auctions to the detriment of other participants. The settlement requires Graham and VCAP to give up fees they obtained while conducting these unfair liquidations that landed certain bonds in their fund manager’s portfolio. To read the order in full click here. February 19, 2015 -- Today, SEC Commissioner Daniel M. Gallagher addressed the newly formed Proxy Voting Roundtable to address two issues: universal proxies and retail shareholder participation in the proxy process. In particular, the Commission is concerned about ways to increase shareholder participation in the voting process. "I’m hoping we can hear about ways to make it less costly for individual shareholders to vote. Could we streamline our disclosures or make them less intimidating for retail investors without loss of informational content for institutional investors? This is obviously not an easy feat, but it is an important issue"
Gallagher also wanted to limit the number of votes that can be taken and suggested the use of technology to aid in the reformation. For example, could we allow individuals to delegate the ability to cast their ballots so long as they are cast consistently with certain voting rules preset by the investor? As for universal ballots, "let’s just say I’m trying to keep an open mind," Gallagher said. This has become an issue with companies and investor relations due to increasing attacks from shareholder activists against global warming, lack of board diversity or a number of other social issues. "What does this mean for the SEC?" Gallagher asks in the opening remarks. Our responsibility in the corporate governance arena is a limited one: it is to ensure that our rules establish a level playing field. I’m therefore interested in hearing from our panelists about the pros and cons of universal ballots, as one stand-alone option in this area, including how they may affect the relationship between shareholders and management. He then goes on to commend an approach recommended by Professor Guhan Subramanian in the Harvard Business Review. The professor suggests using staggered boards and tightening disclosures of activists positions which is an argument for less disclosure. Commissioner Kara Stein is for universal ballots, however, she has also accused her colleagues of being more interested in decreasing the amount of disclosure required rather than improving it, which is what this debate boils down to. To read the opening remarks in full click here. The U.S Commodity Futures Trading Commission's Energy and Environmental Markets Committee (EEMAC) will hold a public meeting on 2/26 from 10am - 4pm at the Commission’s Washington, D.C. headquarters at 1155 21st Street, NW, Washington, DC 20581. The meeting will focus on proposed rules for position limits -- see positions, 78 Fed. Reg. 68946, , 78 Fed. Reg. 75680. You can also watch a live webcast (www.cftc.gov) or listen via conference call using the information provided below. Participants should be prepared to give first name, last name and affiliation. On February 3, Joseph A. Caramadre, was ordered to pay $46.3M in restitution due to a case Caramadre plead guilty to on Nov. 1, 2013 in which he was sentenced to a prison term of 6 years. From 1995 through December 2010, Caramadre was the President, CEO and majority owner of Estate Planning Resources, Inc. As part of the plea deal, Caramadre admitted to scheming 1) financial institutions, and 2) terminally-ill individuals. What did he do? Caramadre purchased variable annuities that carried death benefits, payable if the annuitant died, from insurance companies and assigned terminally-ill individuals as the annuitants. He did not notify the family of the terminally-ill participant about the variable annuities purchased and kept the proceeds for his company. The death benefit is usually the initial amount invested plus any gain from the investment. To find terminally ill patients Caramadre placed ads in the newspaper of the Roman Catholic Diocese of Providence promising $2,000 to all respondents -- those who went on to participate in the scheme received between $3,000 and $10,000. When prosecutors questioned the family members of the terminally-ill patients recruited for the scheme they claimed that even though their loved ones took the money, they didn't understand the full scheme. He is also accused of taking actionable steps to mislead family members. To read the actual charges, click here. Sign up for updates with your email address below. Feb. 13, 2015 — As an update to a post published a few days ago on the Proxy Voting Process, yesterday the SEC announced the agenda and panelists for the Feb 19 roundtable on ways to improve the proxy voting process. The roundtable is scheduled to begin at 9:30 a.m. as outlined in the Agenda, as posted here and below. The roundtable is open to the public on a first-come, first-served basis and the event also will be webcast on the SEC website. Comments are welcome to rule-comments@sec.gov., paper submissions (in triplicate) to: Office of the Secretary, Securities and Exchange Commission, 100 F Street N.E., Washington, D.C. 20549-1090. Mutual funds must ensure that all fund assets are properly protected. Water Island Capital failed to implement the required policies and procedures to ensure all cash collateral was held in the custody of the funds’ bank. On Feb. 12, SEC Chair Mary Jo White made the opening remarks at the first meeting of the Investor Advisory Committee which was established by Section 911 of the Dodd-Frank Act. The committee is tasked with providing advice to the SEC on the regulation of securities products, trading strategies, fee structures, and the effectiveness of disclosures. Good morning, and welcome to this year’s first meeting of the Investor Advisory Committee. Thank you all for making time in your busy schedules to be here. Today, I want to very briefly update you on a few recent developments at the Commission and give you a glimpse of some of what lies ahead in 2015. In November, the SEC adopted Regulation Systems Compliance and Integrity (“Regulation SCI”) which applies to the regulation and disclosure of "exchanges, clearing agencies, FINRA, the MSRB, securities information processors, and alternative trading systems accounting for the bulk of equity trading on such systems." In December, White recounts the announcement that the Division of Investment Management is developing recommendations for the SEC to address portfolio composition with the aim of modernizing and enhancing data reporting for funds and investment advisers. White also discusses the two rules adopted already in 2015, 1) under Title VII of the Dodd-Frank Act, which brings transparency in the over-the-counter derivatives market, and 2) the requirement of disclosure about whether directors, officers and other employees are permitted to hedge the market value of securities obtained through equity-based compensation. the additional Title VII and executive compensation rulemakings under Dodd-Frank, as well as Regulation A and crowdfunding under the JOBS Act. We will also be busy in a number of other important areas, including, to name just a few, enhancements of our equity and fixed income market structure, the asset management initiatives I mentioned, our disclosure effectiveness review, and enhancing broker-dealer financial responsibility requirements. The President's Advisory Council was established in 2013 and created as a way to advise the President and the Secretary of Treasury on ways to foster the importance of financial capability for young adults. Council members include the Secretary of the Treasury, the Secretary of Education, the Director of the Consumer Financial Protection Bureau and up to 22 non-governmental members appointed by the President. This meeting will be held at 10:30 am EDT on March 3, 2015 at the Eisenhower Executive Office Building, 1650 Pennsylvania Avenue NW, Washington, DC 20502. You can view the meeting live at http://www.whitehouse.gov/live. There's no need to register. Questions or comments about the even can be sent to: pacfcya@treasury.gov. SEC senior officials and staff will participate at PLI’s SEC Speaks. See agenda. 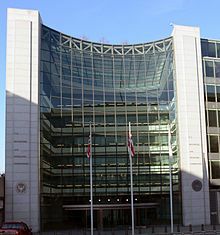 The event will be held at the Ronald Reagan Building and International Trade Center, 1300 Pennsylvania Ave., N.W., Washington, D.C.
On Feb. 11, 2015, the SEC charged five entities with the offering and selling of unregistered penny stocks. First issued on Feb. 6, 2015, the complaint is against Cayman Islands-based, Caledonian Bank Ltd. and Caledonian Securities Ltd., Belize-based, Clear Water Securities, Inc. and Legacy Global Markets S.A., and Panama-based, Verdmont Capital S.A. It alleges that the five entities sold over $75 million in illegal securities from four shell company issurers, namely, Swingplane Ventures (OTC BB: SWVI:), Goff Corp. (OTC: GOFF), Norstra Energy Inc. (OTCMKTS: NORX) and Xumanii, Inc (OTC: XUII). To read the original press release click here. The lawsuit was originally filed by former employees of AstraZeneca who acted as whistle-blowers and received a combined $1.4 million. While this is a public health issue, it is also an issue within the pharmaceutical industry due to profitability targets. “Pharmaceutical companies that pay kickbacks in order to boost profits will be held accountable for their improper conduct,” said Special Agent in Charge Nick DiGiulio in the press release. The announcement gave the Health Care Fraud Prevention and Enforcement Action Team (HEAT) credit for the settlement and partnership between the two departments which was formally established in 2009. Since January 2009, according to the press release, the Justice Department has recovered more than $23.6 billion through False Claims Act cases, with $15.1 billion involving financial fraud against federal health care programs. AZN was up $.19 to $68.44 today and is trading up $.02 in after hours trading. On Thursday, February 19, the Commission will convene a roundtable discussion exploring universal proxy ballots and retail participation within the proxy voting process. Location: SEC Headquarters, 100 F Street, N.E., Washington, D.C.
Last year the SEC charged Saba Software with falsifying time-sheets in order to meet quarterly goals. As a result, William Slater and Peter E. Williams III, the company's two CFO's over the time period -- Slater was CFO from December 2008 to October 2011 and Williams was CFO from October 2011 to January 2012 -- agreed to payback almost $500K to the company's investors. The two were not personally charged with the fraud, but under Section 304 of the Sarbanes-Oxley Act the two can be held responsible for the company's financial negligence. The former CEO is also expected to reimburse the company $2.5 million which is the amount of compensation made over the time period. Commissioner Daniel Gallagher and Lori Schock, will discuss the basics of saving and investing for military members Fort Hood's, Palmer Theater, in Building 344, 761st Tank Battalion Ave. in Fort Hood, Texas. Much of that growth reflects the trend towards equity-based and other incentive compensation, which intends to meet the worthy goal of aligning the interests of the corporate overseers of public companies with their shareholders. However, some have suggested that company policies that permit hedging of the company’s equity securities could have the opposite effect. By allowing corporate insiders to protect themselves from stock declines while retaining the opportunity to benefit from stock price appreciation, hedging transactions could permit individuals to receive incentive compensation, even where the company fails to perform and the stock value drops. The purpose of this rule change is not to prohibit stock-based compensation, but to provide greater transparency for investors. Keep in mind that this is only the first in a series of Congressionally-mandated rules intended to improve transparency in executive compensation. The other disclosures are dealing with "pay for performance" contracts and the ratio between the CEO and the average worker's pay. This proposing release is a positive step in the direction of providing more information to shareholders as to whether the interests of corporate insiders are truly aligned with their own. If you have any concerns, public comments are being accepted. To read Aguilar's full statement click here. Today, the SEC announced the temporary suspension of Scottsdale, Arizona based Med Pro Venture Capital, Inc. f/k/a Modern PVC, Inc. due to questions about the accuracy of financial statements made in a company press release issued on January 12 and a paid research analyst report on January 9 regarding a partnership with Go CNG technologies. As of 12:36 EST, the stock has had no movement and trades for $5.25. It has a 52 week trading range of $1.00 to $10.70. You can read more about the story here, but the full press release won't be published until January 12. Today, the SEC charged John Gray, previously an analyst at Barclays Capital, and friend Christian Keller with trading on confidential merger information supplied by Keller. An attempt to hide the trades was made by placing them in the name of Gray’s friend Kyle Martin. Gray also told Aaron Shepard about the merger. All four have agreed to settle with the SEC by paying more than $1.6 million combined. The first trade was made while Keller was financial analyst at Applied Materials. In 2012, Keller left Applied Materials (Nasdaq: AMAT) and joined Rovi Corporation (Nasdaq: ROVI) as VP for investor relations and finance, and the scheme continued as the four would trade ahead of negative news announcements about Rovi securities. ROVI is down .26% today. To read more about the story click here. In recent statements, the FOMC has indicated that it can be patient before raising the federal funds rate. After its late –January meeting, the FOMC upgraded its assessment of domestic economic conditions, but also noted that international developments will be factored in when considering the date of the first interest rate increase. In public speeches, some FOMC members have signaled that mid-year 2015 could be a reasonable time for such a move, should growth and inflation dynamics evolve favorably over the coming months. But a large degree of uncertainty remains on this front, while commentators and market pricing increasingly point toward a later date. Another complicating factor is the debt ceiling requirement. 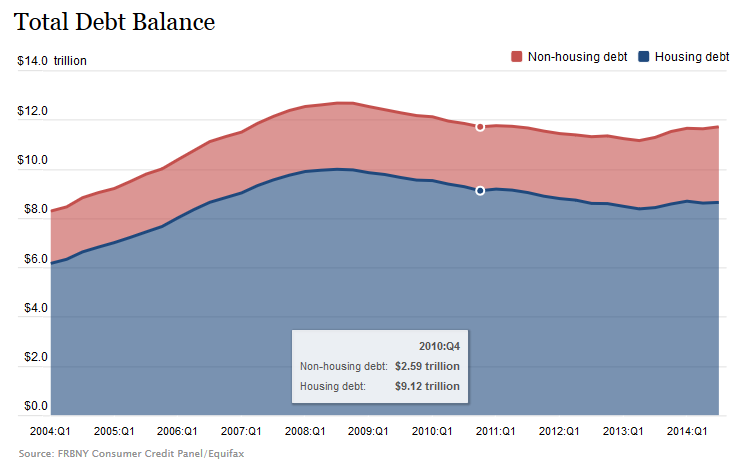 On March 15, the debt ceiling will automatically be increased to include the amount of borrowing that occurred during the suspension period (February 8, 2014 to March 15, 2015) but Treasury is expected to reduce its the cash balance essentially to the level it was on February 8, 2014, approximately $30 billion. As the March 15 date approaches, the Committee recommends that the Treasury absorb excess cash above the required amount through reduced Treasury bill issuance. It's the last sentence that's most interesting. Reduced Treasury bill issuance is akin to raising rates. All signs point to raised rates in 2015. To read the letter in its entirety, click here. 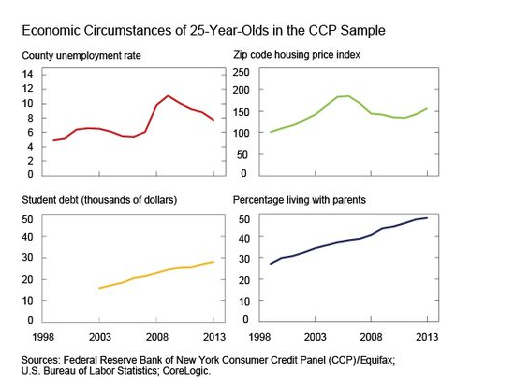 The FRB came out with a report today confirming speculations long circulated by the media, "today’s young people are more likely to live in parental households long into their twenties than were young people one or two decades ago." The trend is widespread and a reflection of three distinct trends including rising youth employment, escalating housing prices, and increasing student debt. The group plans on continuing this research in the future. To read more click here. Miami Regional Director Eric Bustillo and Fort Worth Regional Director David Woodcock will be panelists at the 33rd Annual Federal Securities Institute. Their panel will discuss SEC enforcement and private litigation developments. Advisory Committee on Small and Emerging Companies will hold a public meeting by conference telephone call. At the Dec. 17, 2014 meeting the definition of accredited investors was discussed. Many would like to change the definition to be more inclusive rather exclusive; that is, based on taking a test rather than net wealth. The effect is more investors in the market, especially for private placements and other structured products. Needless to say investment managers love the idea, but policy advocates believe it exposes the vulnerable to risk. The committee will receive advice from companies and small businesses with a market cap less than $250 million and vote at the end of the meeting. The meeting will be broadcast live on the website.